After a failed earlier attempt, Hudson have finally managed to get their latest games out - They were initially listed to be released multiple weeks ago, but were delayed until now for no apparent reason. 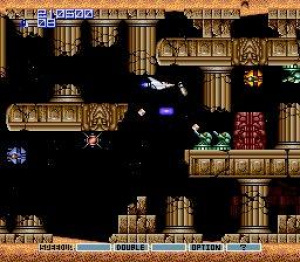 Gradius II: Gofer no Yabou is the sequel to the original Gradius. Strangely enough, neither the arcade version, nor any of its home ports ever made it outside Japan, until a recent collection on the PSP. This TurboGrafx-CD version is arguably the closest to the original arcade game, with great graphics, an awesome CD soundtrack, voice samples and even an exclusive extra stage! As it's an import, and a CD game, it costs 900 Wii Points. 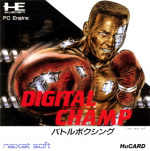 Digital Champ: Battle Boxing is basically a faster-paced version of the Punch-Out!! series. You take control of a boxer from a first-person view and attempt to beat a variety of opponents to reach the top. The problem is that it's just not very fun - The control's a bit iffy, the opponents are all very generic, and there's not a whole lot of different opponents either! Like Gradius II, it's an import, however, this is not a CD game, so it'll run you 700 Wii Points instead. It's anyone's guess how long Hudson's next games will take to come out! On WiiWare this week, you can download the newest installment of the most well-known puzzle series of all time - Tetris Party. You can also grab The Incredible Maze, an interesting game where you tilt the Wii Remote or Balance Board to steer a ball through a maze. Not a great week for me, not particularly fond of shooters, and I just want Super Punch-Out!! We had to get these sometime, and we've had great games over the last month so no big deal, and Gradius is supposed to be good. Glad you guys finally got Gradius II. One of the best Shooters on the VC. Anyway I am waiting for Mike Tyson's Digital Champ: battle boxing featuring Mr. Dream. When is that one coming out? Gradius II, at last! WOOT! Been looking forward to playing this for a long time and I'm stoked to download it this morning and give my shmup skills (or lack there-of, rather) a good run. Not at all interested in Digital Champ, but I can't wait to get my grubby little hands on Tetris Party. Looks to be like an all-around great time. now if they gave us Ordyne and Bravoman, we Europeans would be equal with the Americans in terms of TurboGrafx releases. Not that I would download either. DDR Paladin356 - Sell a few games and download Mana. It really is worth it. Chunky Droid - even if a license has been untouched by anybody for a long time, its still a license that needs to be paid for. Duck Tales is from Disney so Capcom would have to wait until they get the Disney license back from whoever has it right now. Or pay for the rights which probably wouldn't be profitable for a simple NES VC game. I think I'd rather see a licensed game like Darkwing for example get edited so that there is nothing linking it to the Darkwing license anymore - everything would be replaced by a new character and theme but would play identically to the old Darkwing game. It would then be released onto WiiWare. With next week having halloween I expect to see Castlevania III. In the mean time I'll be playing Tetris and Mega Man 9. And as Capcom goes, I'd love to see DuckTales and Little Nemo: The Dream Master. Anybody remember Little Nemo? Great game. Ducktales was such a good game too! maybe you'll get zombies ate my neighbors and castlevania 3. I will be downloading Gradius II, after I beat Shining force: The Sword of Hajya for Game Gear. I think A Boy and His Blob: Trouble on Blobolonia will be coming out next week. Little Nemo was a terrific game; it'd be great to see it get some brand new attention on the VC. I feel bad for anyone who wasn't alive to experience that platformer when it was first released, to be honest. Quite the magic little platformer from Capcom. Gradius II and Tetris Party look worthy of a download. The other two... well, the incredible maze sounds like that sub game in Twlight Princess in the fishing shop... and Digital Champ, would anyone buy this when they could get punch out or play wii sport?? Another weak Monday. I would love to see Super Punch Out, Revenge of Shinobi, Turtles 2: The Arcade Game, or how about the original Contra. These games were HUGE when they came out. What is holding these classics up? Also, I wish Midway would finally cash in on the VC and give us Mortal Kombat, and NBA Jam. You just got Secret of Mana last week - one of the best games on the Super Nintendo! Of course most newer releases are going to seem weak to you! A crappy week, but I can't really complain as the previous two Mondays were freaking sweet. I think the USA has done fantastically well the last few weeks! I remember a few months back you guys were getting absolute rubbish for weeks and weeks. Looks like Nintendo of America is working hard for you guys! Anyone who labels the release of Gradius II a "crappy week" needs their brain examined. Where's the shmup love? Meh. Nothing too remarkable this week in the Virtual Console department. I'll buy Gradius II when I get more points, but I'm not even gonna bother with that Punch-Out!! ripoff. @Bass. So that means we're not gonna see Taz-Mania for the Genesis? Also, you're not missing much with Ordyne and Bravoman.
" So that means we're not gonna see Taz-Mania for the Genesis?" Thats right. We only saw TMNT because Konami had the license for it at the time and has since lost it - hence no more TMNT games on VC. "Also, you're not missing much with Ordyne and Bravoman." I know. I just like to see complete lists. RRRRARGH! I want Earthworm Jim, you bleepers! At this rate I might as well go and get a cart-only copy. @monomaniacpat: Well, at least that way you could get the SNES version. I'm getting really tired of the inferior editions of games releasing on VC (any SNES/Genesis or SNES/NES release where they always seem to release the latter). It's just plain stupid! Anyway, I don't care for the VC releases this week (though that's okay because I've got a looooong way to go in Secret of Mana), but Tetris Party looks sweet! Gotta go get ANOTHER points card now... I'm also kinda glad for a relatively bland week, as I'm a multi-system gamer and am just about to buy Fable II and Little Big Planet. There's almost too many great games coming out right now (just bought Golden Axe: Beast Rider last week, too. Highly recommended)! Oh, well. Hard to complain TOO much, eh? I'm also for once glad for a bland week, eventhough Gradius 2 should be looked at by all. I need to beat SoM and I'm busy with Sonic Cronicles. Sonic Cronicles is really a great but not amazing rpg, imo. Plus I'm getting LittleBigPlanet as soon as they fix their song issue. So many great games so little time. Good Damn it! Where's Earthworm Jim? I could get Gradius 2 while I wait for Gradius Remix to come out. I hope Metal Slug 2 gets released in Japan tomorrow. That will make up for the lack of no Earthworm Jim update. Eh, we knew there was an import week coming up this month. You'll probably get Earthworm Jim next week. @post#14-That would rock! I love both games, especially Zombies. I'm not crazy about the Gradius series. I like Thunderforce and Lords of Thunder. Elemental Master is pretty neat too. Crappy week? Pfft, grow some taste, or at least accept that games you haven't played before can be good as well. IF you live in Europe (your little flag says you do ) you can go ahead and get Earthworm Jim anytime your ready. well these games had to come out this month anyway right? i'm not saying that they are bad as gradius is a good shooter series, i'm just not into the genre. @bass X0 yeah having zombies ate my neighbors come out next week would be great but they might just release animals de la muerte instead. Welp, my hard drive is officially cashed. Pretty much only games that I never want to delete left. I even had to delete a couple games I hadn't finished. But Gradius II is miiiiine. I'll probably get Gradius II. I need smore shmups. @BassX0- Couldn't Konami renew their TMNT license? Neither of these games are for me, but I'm perfectly fine with that. Still need to catch up on some other releases anyway. I hope Metal Slug 2 gets released in Japan tomorrow. From the looks of things, Metal Slug 2 will be released in Japan NEXT week. @Tony: You know, I could have a US Wii maybe? It doesn't matter what country I live in, a US Wii will still load the US Channel. Although in my case, using this hacking tool called 'Any region Changer', my Wii runs games in NTSC instead of PAL (the tool also allows me to change the Wii's County so I can purchase JPN/US VC/WiiWare games). It does mean that PAL VC releases will not work but NTSC VC release do. That's why I'm waiting for Earthworm Jim to be released in NTSC format and downloading the PAL VC in it's crap 50Hz is pointless (unless I go back to using PAL which won't happen ). @Cocoaman. I wish we could get Animales next week, but it's been confirmed for December, unfortunately. @The Joker. I hope they release the original SSB soon too; They should've done that when the Brawl hype was at it's peak. I don't think it has aged very well compared to it's predecessors, but it would be cool to have all the old stages that weren't in Melee. Since next week's Halloween week, we'll likely get either Castlevania III or Rondo of Blood, and possibly Zombies Ate My Neighbors. Earthworm Jim should arrive the week after. @Stuffgamer. "Just bought Golden Axe: Beast Rider last week, too. Highly recommended!" Gamepro and IGN would beg to differ. @Adamant. Are you defending Digital Champ? Seriously!? I actually grew really tired waiting for NBA Jam... so I picked it up at a used game store for like 10 bucks.... now I can alleyoop as much as I want. @Mr. Cheez: No, I'm defending Gradius 2, which is an extremely awesome game that makes this week very good. I didn't see anyone calling the Mario RPG week crappy because we only got one game, so just because Digital Champ isn't really worth downloading doesn't make this a bad week. @Mr. Cheez: Which does a lot to explain why I don't trust idiotic reviewers. Look around the web a bit (even some on Gamepro.com) and you'll see that I'm not the only person who thought those reviewers were full of it. If you like Golden Axe, and you like newer games like God of War and whatnot, I see no reason you shouldn't also like Beast Rider. Just make sure you make use of the highly unusual and much-appreciated ability to change how far back the camera is from the character. It starts too close, imo. Now, some reviewers are better than others (I find the reviewers on this site infinitely more trustworthy that most others, for example), but you should never rely solely on a "professional" reviewer's opinion when deciding what to buy. If you were interested in Beast Rider to start with, you might at least rent it or something. You might be surprised! @MrPoo6321: Did you maybe mean Boogerman? I checked, but can find no evidence of a game called "Fartman" ever having existed. @Adamant: I agree that saying a week is crap just because you've never played a game is dumb. I still don't care for today's VC releases (taste in genres, you know), but I recognize that some people did want Gradius 2, and I'm cool with that. As long as Nintendo can keep varying the genres of the good games from week to week, I'm happy! But I still fear the possible return of week after week of shooters and fighters... Keep up the good balance, Nintendo, PLEASE! Please release these two NOA, PLEASE!?! So, those games are finally out, good, many were expecting Gradius 2, I hope they keep the good weeks. They'll come out eventually, but probably not together. I'd say as far as licenses go they'd have to pay a lump sum? Capcom and Disney have no need to pay money to host this, but Nintendo to give Capcom and Disney money because it's their game and their license. So it's essentially free money for them, especially Disney as Capcom would provide the ROM and probably give it the Operations Guide. I don't know about anyone else but I can't see why that wouldn't be a fair trade to get more decent content like DuckTales on the VC. I also thought Ubisoft had the TMNT license at the time, as it came out around the time the movie came out. I remember IGN doing a report on it a couple of months before it came out on VC, but I could be wrong. "As you know, currently we do not hold the video game license for TMNT, so we had to create a new licensing deal for these titles." I had no idea. I thought it would be interesting to see how its broken down, but I was going by there being no other licensed games on the VC except for Turtles meant that only companies who still had the license could release their licensed games. Yeah that's what I thought too so I thought I'd do a bit of investigating. I'm really curious why there isn't any more licensed content now! @RadioShadow Very clever I would do the same thing myself but i worry that the tool would brick my Wii. While Capcom/Disney games might be cool (Goof Troop I'd download for sure! ), what I REALLY want for VC is for Konami to renew their Warner licenses (particularly Tiny Toons and Animaniacs). They kept those licenses going for YEARS after the shows were canceled, but dropped them around 2003 or so, I think (can't find exact info). Buster Busts Loose is one of my all-time favorite platformers! One particular platformer whose lack of presence on the VC still bamboozles me is Blaster Master. Come to think of it, I don't know of any Sunsoft games currently on the VC, although I'm not sure what definite reason there is for that, if any. Blaster Master is a game that certainly demands a new mass-market release on a system like the Virtual Console and is certainly one that I think most of us would agree qualifies as an instant download. Heck, if Earthbound is finally getting VC love, I suppose anything is still possible. In response to those taking issue with me calling this week crappy, it was personal opinion. As they say, opinions are like a**holes. Everybody has one, and they all stink. That includes myself and everyone else. I'm not likely to change my mind any more than any of you that disagreed with me.. They released the original TMNT so they might release the other but probably not for a long time if they do. @post#58: I'd love to have Blaster Master on the VC. Awesome action game! I loved Buster busts loose as well! The mini-games were awesome! EDIT: Seems that Terraglyph picked up Tiny Toons in '96, then Conspiracy Games (the makers of BAD BAD games like Ninjabread Man) picked it up in 2001, but Treasure!!! of all companies made a game for the GBA, I wouldn't mind playing that! @chunky_droid: Wow, I guess I didn't really try all that hard on my research, huh? So...does anybody still hold the license NOW? With the recent release of the Tiny Toons volume one DVD, it seems like the PERFECT time to bring some classic games back! Yessss !! Finally Gradius II !! @Chunky Droid. Thanks for the research. I was starting to think all hope was lost for 'ol Taz! The Treasure game I think you're referring to is Astro Boy: Omega Factor. I know nothing about Astro Boy, but I've heard that game was awesome. @Jackolantern. I want to see Blaster Master on VC too. I haven't played it, but it sounds like a cool little action game. And we have gotten a Sunsoft game already (Super Fantasy Zone), so it is possible. I already have Gradius II, and honestly it's my least favorite Gradius game, and appearantly Digital Champ isn't any good, so I'll pass on that one as well. Guess there's nothing here for me. Speaking of Sunsoft, I hope Galaxy Fight comes out soon, because they're coming out with a collection, and GF's the only good game on it. @Mr. Cheez: Actually, chunky_droid was referring to Tiny Toon Adventures: Buster's Bad Dream/Tiny Toon Adventures: Scary Dreams (got retitled from European to American release, apparently), which was developed by Treasure. Sounds great, but it's also apparently very rare because the idiots never made enough copies or distributed it properly. But you're right that they also made that Astro Boy game. Yeah Treasure made both games, I'm not much of an emulator/rom kinda guy so I'm keen to find a copy somewhere! And apparently Treasure made a Tiny Toons game that never found release aswell. they need good games to release throughout next year and the year after that too otherwise the VC will die a death if nobody is interested in purchasing new games from it. sure we'll be happy but nintendo won't. people download the games this week as something to do while waiting for the games they really want. if we get the games we really want now, then those people won't be wanting to download the likes of Digital Champ because they'll be playing the good games. @OoT_For_Life! : Did you miss the fact that Kirby Superstar Ultra released on DS a month ago? That killed any and all chances of it hitting VC. You're right about the other games, though, relatively (I prefer Yoshi on GBA, and I don't really like Super Mario Kart anymore now that I'm used to the newer ones...). But we did just get SMRPG followed shortly by Secret of Mana. This is an unprecedented level of close-together awesome. Begging for even MORE awesome might be pushing it a bit. That said, I haven't seen a truly TERRIBLE week since before SMRPG hit. Sure, we don't want these games, but some people were looking forward to Gradius 2. I choose, therefore, to simply be happy for them that they now have what they wanted. besides, too many "must-have" games released in such a short period of time means it gets very expensive and you won't be able to play each game properly.